Plantation shutters are great at insulating rooms by reducing heat transfer through your windows. When installed properly, there will be a tight seal around the edges that won’t allow air from escaping or entering through the hinges. This makes plantation shutters perfect for maintaining a comfortable interior temperature all year-round. Due to the energy efficiency of planation shutters, some states even give you a tax credit if you install them in your home. a. Buyers that understand the energy efficiency of shutters will be happy to know they will save on energy bills. b. Plantation Shutters a durable, easy to maintain and can add a luxury feel. c. They have a longer life span than most window treatment styles. Interior shutters are one of the best options for child and pet safety since there are no cords to get tangled in. With optional locking mechanisms, it also prevents children from being able to open and close them on their own, preventing accidents. Most modern interior shutters are created to last. The best plantation shutters are designed to keep their appeal, meaning they will not warp, crack, chip, fade or peel, even in the sometimes-harsh South Florida weather. 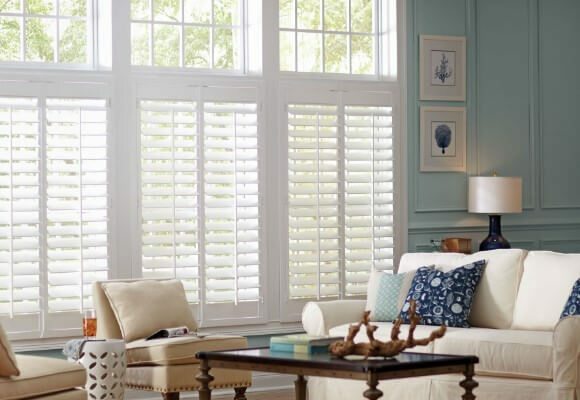 If you are looking for window treatments that are not only aesthetically appealing, but also offer a great return on investment, plantation shutters are a great option. No matter the shape, size or location of your window, Shades By Design can custom design and a solution that will fit your needs perfectly. To learn more or to schedule your free consultation, contact us today.